If you teach kindergarten through second grade, chances are you have explored fact families with your students. But why do fact families matter? 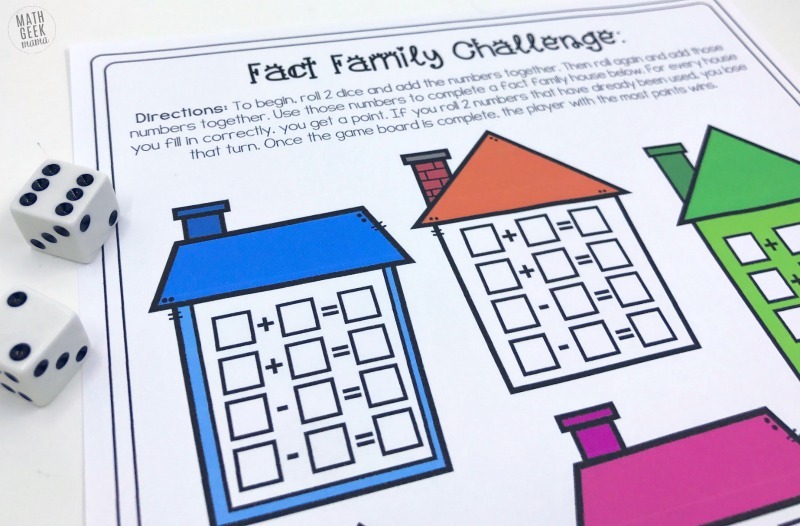 How does working with fact families help student understanding? 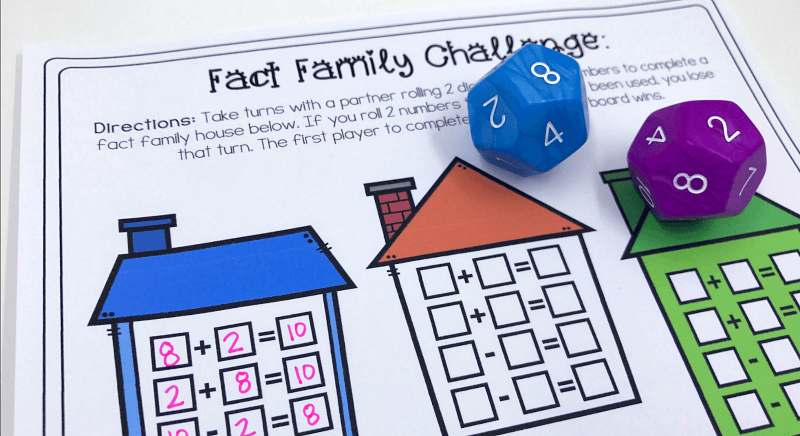 Today I’m going to explain what fact families are and provide some super simple, one page fact family games so you can practice with your kids. There are a variety of options, allowing you to differentiate easily. There are also small group and whole class options. An addition and subtraction fact family is a set of three numbers that form a group of addition and subtraction facts. When you have 3 different numbers, there will be exactly 4 equations, 2 addition and 2 subtraction (as seen above). When you have two numbers that are the same in a fact family (in other words, the two “parts” are the same) such as 3, 3 and 6, you will have exactly 2 equations, 1 addition and 1 subtraction. In this case, it would be 3 + 3 = 6 and 6 – 3 = 3. Why Are Fact Families Important? Seeing the relationships within a fact family helps kids to see mathematical properties, such as the commutative property, that a + b = b + a. In other words, they can see that when you switch the addends, the answer is still the same. They can also see the part-part-whole model of addition and subtraction. That when you have two parts and you put them together, you get the whole group. Likewise, when you take the whole group and remove one of the parts, you’re left with the other part. This is important for kids to understand as they begin to work on addition and subtraction word problems. 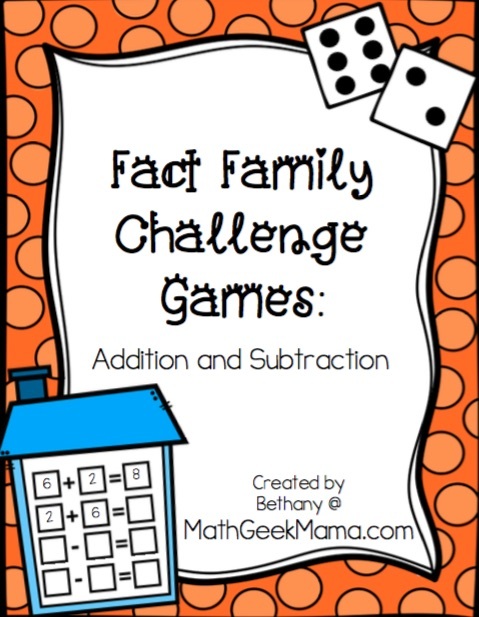 Finally, fact families help show the relationship between addition and subtraction. This is crucial for kids to get before they move on to more complex mathematics. Please hear me: fact families should be a tool that aids student understanding, NOT a skill to master. If your focus is on making sure kids can accurately fill in a chart, or fact family house or number bond, and you’re testing them on it as a skill in and of itself, you’ve missed the point. 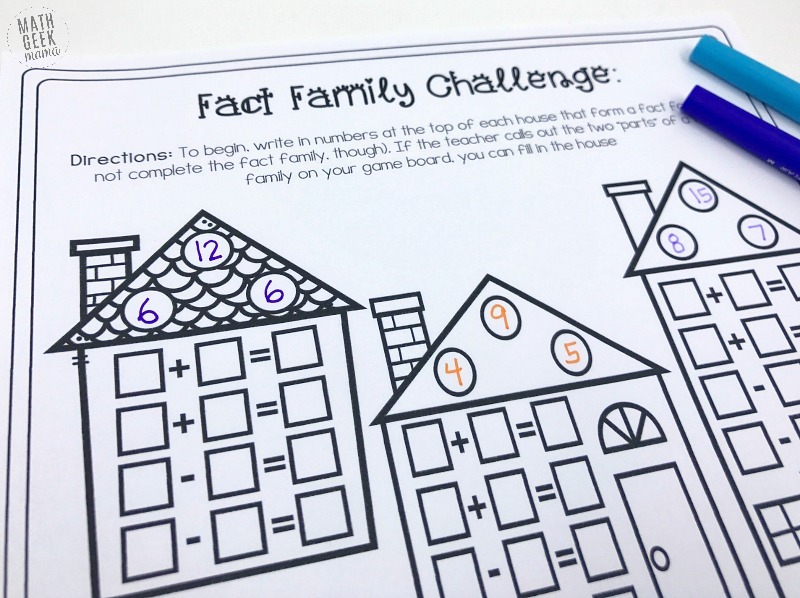 Using and exploring addition and subtraction within fact families should be a tool and a visual to help kids connect concrete ideas (for example, building it out with blocks) to visuals (such as fact family houses or number bonds) to abstract equations. 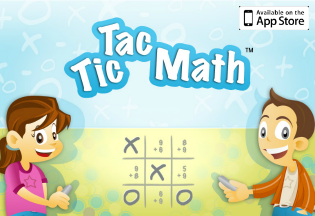 So I would encourage you to play these games as a fun way to review addition and subtraction and to challenge kids to make connections. Don’t worry so much about “mastering” fact families. I would also encourage you to let kids (especially younger ones, like Kindergarten and 1st Grade) to use blocks with a 3-section plate or hand drawn number bond to “act out” or “build” each problem set before they fill in the equations. This will help them to better understand the math that’s happening before they worry about writing formal equations on their game board. 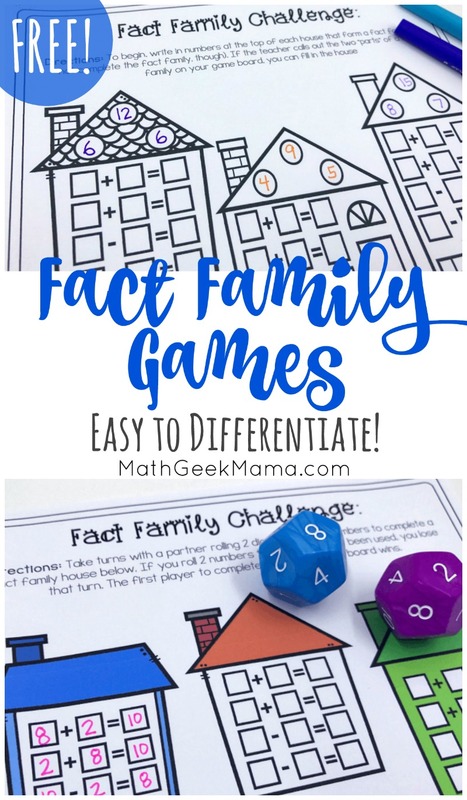 Now, I’m excited to share this set of fact family games! For these games, all you need is a set of dice, but you will need to determine how you want to play before you begin. First, will kids play with a partner on a single game board (meaning the player to fill the most houses wins) OR will kids play in a small group and each get their own game board (and the first to fill their board completely wins)? If you’re placing kids with partners, you can print just one game board per pair. If you’d like to play this with a small group, you print a game board for each player. 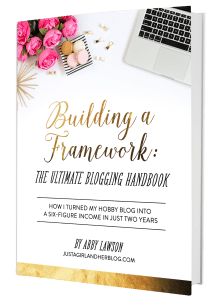 Next, you need to determine how big of numbers you want kids to work with. The first game board says to roll two dice and use those 2 numbers, meaning all the numbers will be within 6. (Or you could use 2 12-sided dice and have all the numbers be within 12). Playing with a small group is played the same way, but each player is playing against themselves to fill in their game board (meaning, if they roll two numbers they’ve already used they lose that turn). 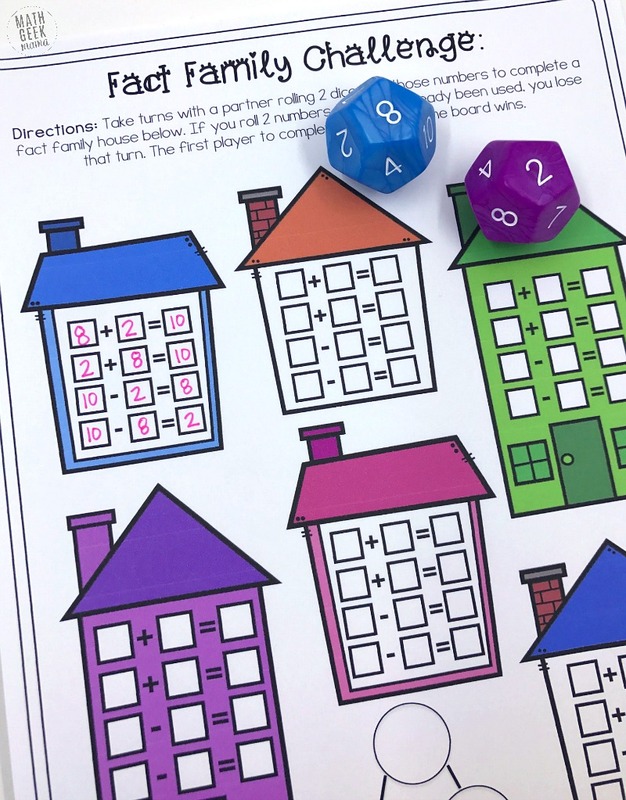 Each player takes turns rolling the dice and either filling in a fact family house on their game board or passing it on (if they roll a “repeat”). The first player to complete the whole board with different fact families wins! Finally, there is a black and white version that you can use to practice with fact families with your whole class or large group. In this game, each player uses their game board like a BINGO card. To get started, print a game board for each player. Each student then fills in the top three circles with numbers that form a fact family (but they do NOT fill in the equations). You can determine ahead of time what range of numbers you want to work on. This could be numbers up to 10, numbers up to 20 or even numbers up to 100! Once every student has their game board filled out, you (the teacher) call out two “parts” of a fact family. (To make this fair, you might want to write all the numbers on slips of paper ahead of time and draw them randomly out of a hat). Any kids who had 8, 13 and 21 (the “whole” in this example) would then be able to complete the equations on that fact family house. You then continue to call out “parts” until someone completes their board. The first person to correctly complete a game board wins! 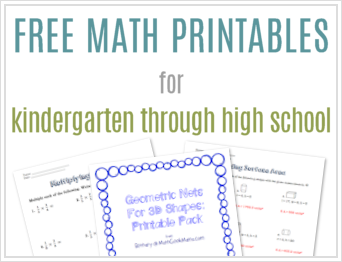 I hope you’re able to use these for fun math game time and great class discussions in your classroom! 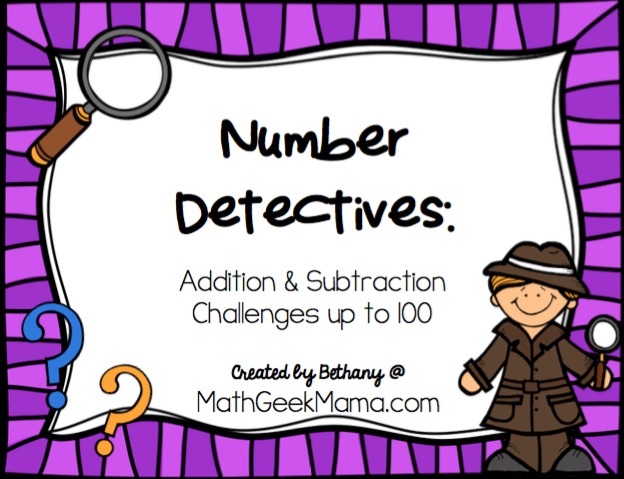 If you’d like more practice with addition and subtraction, you like this set of Number Detectives Challenges. It includes open ended exploration with addition and subtraction up to 100. 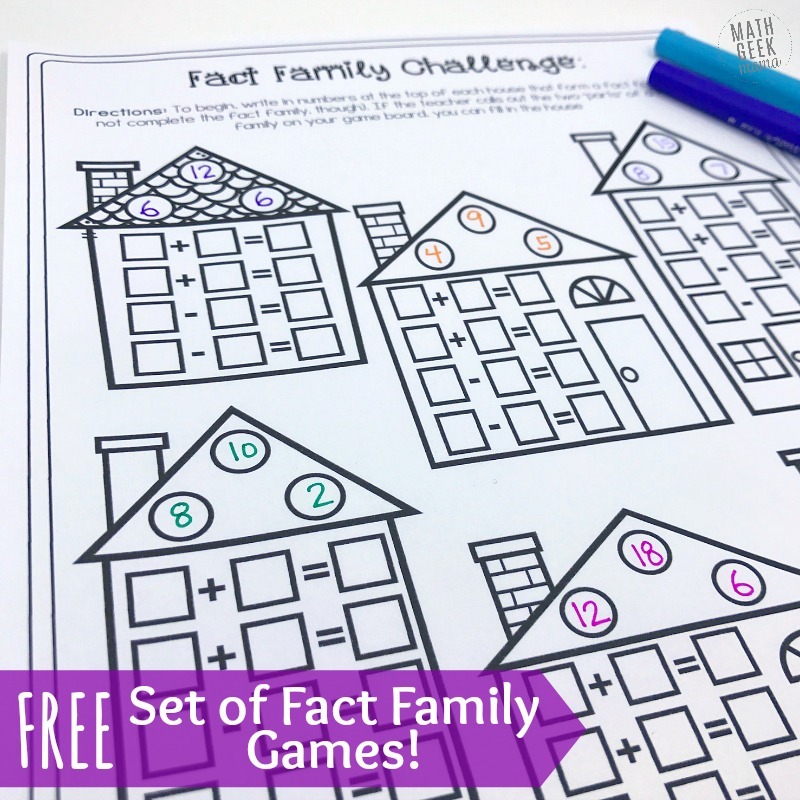 And of course, be sure to grab these fact family games, free in my shop!